Tax policy requires economic models that can predict how changes in the tax code will affect economic behavior and tax revenues. As shown in the tax incidence literature, taxes alter relative prices of goods, services, and factor inputs, and cause substitution effects which can limit the revenue from the taxes. Moreover, taxes often create economic distortions, which limit the potential of an economy. As such, policymakers need a tool to measure the impact of one policy against another. Economic models can provide policymakers with a means of scoring the effects of tax policy on tax revenues and economic growth, but the manner in which the model is constructed can bias the predictions. Several models are currently used to score tax proposals. The Joint Committee on Taxation (JCT) uses two models: the Macroeconomic Equilibrium Growth (MEG) and the Overlapping Generations Lifecycle (OLG) models. Both models have strong assumptions about the behavior of individuals and institutions. In particular, the MEG model assumes the Federal Reserve dynamically reacts to a change in prices caused by a change in tax policy while the OLG model assumes that representative agents within a population are able to utilize perfect foresight in making their economic choices to optimize their welfare according to specified utility functions. The complexity injected into these models via these assumptions may interfere with their ability to simulate reasonable real world responses to tax changes. Moreover, neither of these models have been released to the public, and the actual mechanics of the models are unknown to most of the profession. In an attempt to provide a realistic data driven analysis of the economic and budget consequences of tax policy, the Tax Foundation and Gary Robbins have developed the Taxes and Growth (TAG) model. The TAG model is a neoclassical macroeconomic model that focuses on the production side of the economy and the effects of tax-driven price changes and incentives. Unlike the MEG and OLG models, the TAG model does not assume that other government institutions interfere with the economy or that individuals optimize a particular utility function. Instead, the TAG model focuses on historical relationships found in data provided by the Bureau of Economic Analysis (BEA), the Federal Reserve, and the Internal Revenue Service (IRS). The TAG model employs simple market driven adjustment mechanisms based on standard production behavior as described in the economic literature. The TAG model consists of two main parts: a production-side, or neoclassical economic model, and a tax-return simulator. The two parts connect in two aspects: effective marginal and average tax rates and growth factors. The effective marginal tax rates are outputs of the tax-return simulator and inputs into the economic model. The growth factors are outputs of the economic model and inputs into the tax-return simulator. Both parts of the model interact with each other iteratively to find the equilibrium of the economy after a tax policy change. The marginal tax rates drive economic changes. The average tax rates affect revenue calculations. The economic model is separated into four sectors: private corporate, private non-corporate, government enterprises, and households. Each sector is based on definitions and data from the BEA. Financial institutions are separated into corporate and non-corporate, and they are added to the appropriate sectors. The Federal Reserve is separated into the government enterprise sector. The household sector includes home production, imputed rents, and non-profit production. Each sector has a separate production function. The production functions are Cobb-Douglas formulas with constant returns to scale. The parameters to the formulas are estimated from the outputs and inputs of each sector. Inputs to the production functions are labor (L), in hours, and capital (K), in dollars. The total factor productivity (a) coefficient and marginal factor productivity exponents (α) are estimated from long-run BEA data. The output is the total goods and services available within the sector. Any additional goods and services beyond the sum of the sectors used domestically must be balanced with imports. The output of the production function is distributed to either labor or capital based on a constant share parameter estimated for each sector. The sum of the labor shares of production per labor hour from each sector sets the gross wage for all sectors in the economy. The net wage is the gross wage less the effective average tax rate on labor, which is generated by the tax-return simulator. The desired labor supply for the entire economy is determined by an elasticity of labor (e). The elasticity of labor is a stylized fact. The labor supply is divided into each sector based on the original distribution between the sectors. Each sector has two service prices: an observed service price (OSP) and a minimal required service price (MRSP). The OSP is the gross return to capital observed in the economy. The OSP is calculated by dividing the capital’s share of output by the stock of capital in the economy. The minimal required service price is the theoretical limit of an investor’s willingness to invest. The MRSP uses equations derived from Jorgenson and Hall (1967.) 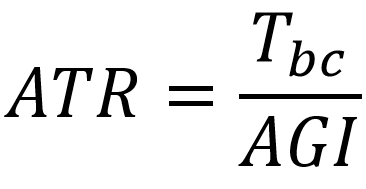 The minimal required return is calculated with the long-run return to capital (r) and the economic depreciation (δ), which are used for all sectors. Each sector has a different MRSP equations because the tax regimes vary by sector. Both the corporate and non-corporate MRSP include investment tax credits (itc), the net present value of tax depreciation schedules (Z), and a bases adjustment of the tax depreciation from tax credit (Ba). In addition, the corporate and non-corporate pay estate taxes (te) and property taxes (tp), which is accompanied with an income tax deduction. The corporate sector has a second layer of taxes. Since the taxes are on the returns to the individual investor, the return (r) must be grossed up to cover the additional individual taxes. The effective tax rate on individual income from a corporate source is calculated as the weighted average of the taxes on dividends (td) and capital gains (tkg). The government enterprises and household sectors have fewer taxes than the two business sectors. Since government enterprises are largely exempt from most taxes, the minimal required service price is the sum of the required return and the economic depreciation. The household sector includes many aspects of the economy that are either tax exempt or subsidized through taxes, such as not-for-profit institutions and imputed rental income to home owners. In addition, the consumption of fixed capital is difficult to measure or estimate. As such, the minimal required service price of the household sector is only effected by tangential factors. Given the measurement difficulties of the household sector, the TAG model uses a heuristic to adjust the household sector’s service price. The heuristic adjusts the baseline service price proportionally to the change in amount of homeowner-occupied residential-structures (own*krs) and the marginal deduction on taxes paid (dtp). The baseline service price is derived from the nonbusiness income (ynb) and the household sectors capital stock (Khh). The desired level of capital for each sector is calculated with a multiplier and the initial capital stock. The multiplier is a ratio of the OSP to the MRSP. The multiplier grows the desired capital stock when the OSP is greater than the MRSP and contracts the capital stock when the OSP is less than the MRSP. The desired capital stock is only equal to the initial capital stock when the OSP is equal to the MRSP. At this point, all capital that could return the MRSP has been purchased and all other opportunities are not possible without reducing the MRSP. Once the desired capital stocks and the desired labor supply are calculated, the Cobb-Douglas production function generates the new level of production in the economy. The new level of production estimates the new wages and observed service price. The changes in the economy cause a shift in the tax burden due to wages and capital income shifting individual tax brackets. As such, the change in the price factors in the economy create three growth factors: business income growth (big), wage income growth (wig), and other income growth (oig). These growth factors are calculated by dividing the new levels by the old levels. The business income growth factor is the weighted average of the corporate and non-corporate sector. The tax-return simulator uses the Internal Revenue Service’s (IRS) public use files (PUF) to determine the effect of a tax change or economic growth on individuals’ tax burdens and after-tax incomes. The PUF consists of over 140,000 individual tax returns, which statistically represent all individuals who filed tax returns. The tax-return simulator uses the income and demographic information from the PUF to simulate the change in tax burden and after-tax income for an individual tax filer if the tax code were different or particular types of income have grown. Aggregate tax rates are calculated from the simulated tax returns weight by the portion of the filer each return represents. Aggregate tax rates are passed to the economic model as a wedge on prices. For each tax return within the PUF dataset, the economic growth factors increase/decrease individual incomes based on the type of income. The new income levels are passed through a tax-return calculator, which is based on the proposed tax code. The resulting tax burdens are used to calculate the effective marginal and average tax rate on an individual’s income. These rate are used to calculate the after-tax prices in the economic model. The tax-return simulator has five growth factor inputs: non-corporate growth, corporate growth, wage growth, interest growth, and other growth. In practice, the non-corporate growth and the corporate growth both receive the business income growth (big) factor from the economic model, and the interest growth and other growth both receive the other income growth (oig) factor from the economic model. The wage growth receives the wage income growth (wig) factor for the economic model. Each growth factor affects different parts of the PUF dataset. Wage growth factor scales the wages, self-employment income (SEInc), and the state and local income and sales taxes (SLISTx). The interest growth factor scales taxable interest (IntInc), tax-exempt interest (ExInt), investment interest expense (InvInt), and deductions for interest paid. The corporate growth factor scales ordinary and qualified dividends (DivAGI & Qdiv), net short-term and long-term capital gains (StGlessL & LtGlessL), net capital gains or losses (CGAGI), capital gains distributions (CGDist), and other capital gains from selling or exchanging assets in a trade or business (CGOthr). The non-corporate growth factor scales the schedule C, E, and F income (SchCInc, SchEInc, and SchFInc), rent and royalty net income and net losses (RRNetInc & RRNetLoss), partnership and S-corporation net income (ParSbCnetInc), investment income (InvInc), and state and local real estate taxes paid (SLRETx). The other growth factor scales taxable refunds, credits, or offsets of state and local income taxes (SLtax), alimony received (AliRec), other income on schedule E (SchEOInc), other or miscellaneous income (OthrInc), total social security received (GrSS), total adjustment on gross income (Adjust), IRA distributions (IRADist), taxable pension and annuity income (PenSGI), and unemployment compensation (UComp). The average tax rate (ATR) is the share of an individual’s income paid in taxes. The ATR describes the general tax burden placed on individuals when deductions, exemptions, and inclusion factors are included. The ATR is calculated by dividing the total tax burden (T) before credits by the aggregate gross income (AGI). Credits are not included in the calculations to avoid negative average rates at the lower end of the income distribution. The statutory marginal rates are often not the marginal rates experienced in the economy. How income is defined for tax purposes changes the base to which the statutory rates are applied. The often smaller base effectively lowers the impact of the tax at the margin. To account for the change in the base, the economic model uses an effective marginal tax rates (EMTR) as wedge on prices. The EMTR is calculated by scaling the statutory marginal rates by the ratio of the incremental tax base to the actual incremental income. As such, the effective marginal rate include all changes to the base due to the tax code. Several marginal rates are affected by the basis adjustment. Exclusions on social security benefits and capital gains change the base at the margin. Phase-ins and phase-outs of deductions, credits, and exemptions create changes in the base at the margin due to marginal changes in the base of the schedule. Add-on taxes, such as the Additional Medicare Tax, also require a basis adjustment at the margin because of the portion of income on which the additional tax is levied. Effective marginal tax rates with a credit phase in/phase out are calculated using a linear formula. The effective marginal rate after deduction, but before credits is modified by the phase in rate or phase out rate (PIR/POR). This accounts for a credit’s effect on the tax burden and not the base. The economic model and the tax-return simulator interact with each other until the model reaches an equilibrium. The scoring process starts by simulating the effect of the proposed tax code on the PUF tax returns, which generates new marginal tax rates. The new marginal tax rates change the after-tax price of labor and capital, which cause the model to fall out of equilibrium. Changes in the prices cause a growth or reduction in the stock of capital and the supply for labor, which grows or contracts the economy. In turn, these growth factors change the incomes of individuals in the tax-return simulator. The system cycles between the tax-return simulator and the economic model until the percent difference between the previous cycle and the new cycle is with a tolerance. In practice, the model usually cycles 5 to 6 times before the percent difference is within a tolerance of 0.000001%. Critics of the TAG model note that the model does not currently estimate the effects of changes in private and government spending policies, and focuses primarily on changes in tax policy. The Tax Foundation is seeking to expand the model to include the economic effects of spending. However, the expanded model will not involve the use of neo-Keynesian multipliers. Rather, it will be based on the incentive and substitution effects of the provision of public goods and their contribution to or distortion of productive capacity. It will also describe the returns-driven allocation of assets across borders and the allocation of spending across sectors. In effect, the Tax Foundation is expanding the production side model into a general equilibrium model called the Financial Assets Integrated Model (FAIM). Like the TAG model, the FAIM model is a neoclassical model, but it describes a general equilibrium in which two systems of equations must balance: a supply-side production function and a demand-side budget share function. FAIM’s general-equilibrium economic model is accompanied by a tax-return simulator, which generates average and marginal tax rates. The tax rates are used as tax wedges on factor prices in the economic model. The FAIM model expands the original TAG model by adding a demand side to the economic model along with explicit government and international sectors. The demand side of the model utilizes a demand system of price, income, and cross-price elasticities within an opportunity-cost framework. The demand system is estimated from BEA data using a modified nonstationary translog demand system (NTLOG) model introduced by Lewbel and Ng. The demand system determines the quantity of leisure demanded and hence the quantity of labor supplied, the domestic and foreign capital assets that domestic households and businesses would like to hold, the domestic and foreign government debt that domestic household and businesses would like to hold, and the level of consumption in the economy. The government and international sectors account for the flow of financial assets as the economy grows or contracts. The government sector tracks the effect of the debt on the government’s cost of servicing the debt. In addition, the government sector can explicitly track the effects of increasing government assistance programs on the incentive to produce, and on the allocative outcomes via the demand side of the economy. FAIM will have the capability of analyzing the combined effects of government spending and tax changes. The international sector tracks the effects of rapidly increasing or decreasing desired capital stocks on international capital markets. The international sector captures the capital payments that leave the domestic economy to the foreign owners of domestic assets and adjusts the growth factors for the tax-return simulator to reflect the actual growth in incomes. In addition, it captures any changes in domestic ownership of foreign assets as incomes change domestically. Both foreign government debt and capital assets are included in the international sector. The FAIM general-equilibrium model will increase the Tax Foundation’s capability to analyze tax proposals. The inclusion of the demand side in the economic model allows government spending to affect economic growth and increases the accuracy of the tax-return simulator. The government sector captures the effects of government debt on interest rates while international sector helps to explain the mechanics of international capital flows to critics. With the addition of these features to the TAG model, the Tax Foundation can drive the tax-policy debate toward sustainable economic growth. The Cobb-Douglas parameters are estimated in a log-linear regression analysis of GDP estimates from BEA since 1960. The constant shares are stylized facts. They are calculated as the average of the observed shares from 1960-2010. The academic literature place the elasticity of labor between 0.1 and 0.4. The TAG model uses an elasticity of labor of 0.3 while the Joint Committee on Taxation (JCT) uses an elasticity of labor of 0.19. Both are reasonable parameters of the labor market’s response to changes in real after tax wages. The long-run return to capital is the average of after-tax, after-depreciation returns calculated from Bureau of Economic Analysis 1960-2010. The Public Use Files (PUF) are compiled by the Internal Revenue Service’s Statistics of Income (SOI) division. The PUF are a dataset of over 140,000 statistical representation of individual tax return in the U.S. economy. Each return represents a portion of the population and contains all the element required for an individual to file a tax return.